Why Do Fish School Together? Few aquarium scenes are more enjoyable than a group of fish swimming in unison, changing directions in an instant, yet never colliding with each other. How are fish able to swim in such perfect unison? Why do some fish swim alone while others prefer living in schools? Is it necessary to keep aquarium fish in schools? Not everything is known about schooling behavior, but here is what experts know about how and why fish swim in schools. First and foremost, schools protect fish from their enemies. It's the same rule our mothers taught us as youngsters, always stay in a group because there is safety in numbers. Predators find it far easier to chase down and gobble up a fish swimming all alone, than trying to cut out a single fish from a huge group. The same holds true in reverse. Fish can better defend their territory in a group. 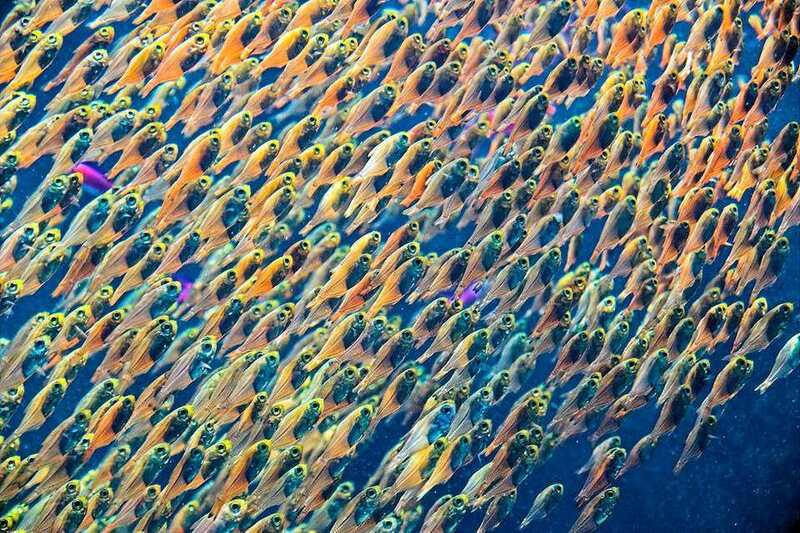 Bullies will think twice about facing an angry school of dozens or hundreds of fish. It is also believed that swimming close together reduces friction and allows fish to conserve energy while swimming. When dinner time comes along, food is easier to find as a group. Having fifty sets of eyes and noses gives the school a better chance of locating food. Last but not least, when fish spawn a school ensures that at least some of their eggs will elude predators due to the sheer numbers produced by a large group of fish. A complex combination of senses allows fish to achieve those smooth schooling movements we marvel at. At one time it was believed a leader in the school directed the movements of the entire school. However, it is now known that each fish responds to the movements of the other fish, as well as stimuli such as pheromones. If one fish moves in a different direction all the others sense it and move accordingly. The anatomy of fish also factors into the schooling equation. Eye placement on the sides of the head allows the fish to readily see what is next to them and move accordingly. However, sight is not the only factor used in schooling. Fish are able to establish their placement and direction in a school by using hearing, lateral line, sight, and even the sense of smell. Even though 80 percent of all fish live in school at some point in their lives, some fish live solitary lives. As a rule, smaller fish are more likely to live out their lives in schools, although some large fish will school together. Furthermore, not all fish that school do so for protection in numbers. In fact, some of the fiercest fish in the world live in schools. Piranha fish live in large schools that they are born into. Although they tolerate their brothers and sisters, a new piranha attempting to join the school later is usually attacked and killed. How Many Fish Make a School? There isn’t a magic number that defines a school. However, in the wild schools of fish are generally quite large, often numbering in the hundreds or even thousands. In captivity, schooling fish need to have at least four to six to create a comfortable school. The old adage, the more the merrier, definitely applies to schools of fish. In other words, you can’t have too many fish in a school. Quite a few popular freshwater fish prefer to live in schools. Barbs, Danios, and most Tetras should always be kept in schools. Loaches such as the Clown and Kuhli loach often will pine away if they are not kept in a school of their own kind. Even larger fish such as the Silver Dollar prefer to live in a school. It's a good idea to do your homework before choosing and purchasing a new fish, so know you up front if they are best kept in a school. If the fish you are considering prefers to live in a school you should plan on purchasing at least four of the same species. Generally, it’s best if you can purchase them all at the same time. If not, purchase groups of 3 or more at a time, rather than adding one fish to the school at a time. Also consider the size of the tank required to keep a school, as schools require more space. A good local fish shop will advise you on what is needed. How Do You Care for the Pearl Danio Fish?